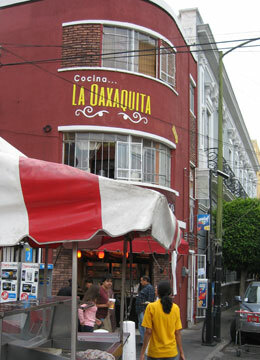 La Oaxaquita, a small, relatively new restaurant on the periphery of the immensely popular plaza outside the neogothic Expiatorio church in central Guadalajara, promises to notch up the quality of food offered around one of the city’s jewels. As the name suggests, La Oaxaquita, which means The Little Lady from Oaxaca, offers breakfast and dinners à la Oaxaca, one of Mexico’s southernmost and more exotic states (with its capital city of the same name). The restaurant sits on the second, third and fourth floors of a building a stone’s throw from the well trafficked Expiatorio and just alongside and above a perennially open stall which serves popular if not delicious hamburgers and hot dogs.